Our most popular holster because it's so useful. Extremely well-made, with heavy-duty grain leather, waxed thread and extra riveting for long lasting use. For belt or pocket, high-tension metal clip on back. Helps keep your trusted Felco pruners or one-hand wire cutters handy! Also known as the F91. 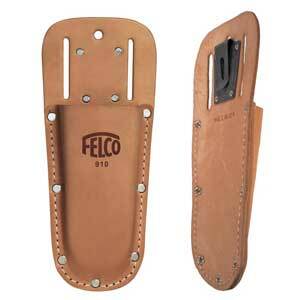 Holds any Felco pruner, Felco one-hand wire cutters, the F-CP cutter or the F600 pruning saw.